A PhD position or a Post-Doc position, depending on the candidate skills are available in the Department of Sciences and Methods fo Engineering at the University of Modena and Reggio Emilia, Italy. The research project is in the smart composite materials design. The candidate will have to design and optimize a composite structure with embedded SMA for morphing application. Candidates should have possibly a strong background in mechanics, finite elements simulations and smart materials. The superelastic response of NiTi shape memory alloys under various loading conditions is experimentally investigated using thin-walled tube specimens. The isotropic relation between the elastic and shear moduli of austenite and martensite as well as the von Mises stress and strain equivalency are also studied in uniaxial tension and pure torsion. In addition to proportional loading, several non-proportional loading experiments based on both force and displacement control modes are conducted. A 3D constitutive model is proposed and verified with experimental data. Tension-torsion coupling effect and tension-compression asymmetry effect is investigate for tube shape memory alloy. the capability of this approach. This publication will benefit the numerical and experimental study on SMAs. Saleeb, A. F., Dhakal, B., Padula, S. A., & Gaydosh, D. J. (2013). in binary NiTi alloys. Journal of Intelligent Material Systems and Structures, 24(1), 70-88. I' m trying to make a model in VUMAT for shape memory alloy based on Lagoudas 's thermomechanical constitutive model. It seems that It's necessary an iteration to evaluate the thermoelastic prediction. My questions are : is it possible to use an iterative loop in the VUMAT or it's better to avoid it? ?Could someone suggest me a different way so that I can avoid the iterative loop? With the increasing use of shape memory alloys in recent years, it is important to investigate the effect of cracks. Theoretically, the stress field near the crack tip is unbounded. Hence, a stress-induced transformation occurs, and the martensite phase is expected to appear in the neighborhood of the crack tip, from the very first loading step. In that case, the crack tip region is not governed by the far field stress, but rather by the crack tip stress field. This behavior implies transformation toughening or softening. Stent and Nitinol have revolutionized the medicine. In past decades, guidewires, stents, filters and many minimumly invasive devices and implants are made of Nitinol and they proved to be very successful. Published in Acta Materialia 53 (2005) p4955-4961. Abstract — We present the results of a crystallization study on NiTi shape memory thin films in which amorphous films are annealed by a scanning laser. This technique has the advantage that shape memory properties can be spatially distributed as required by the application. 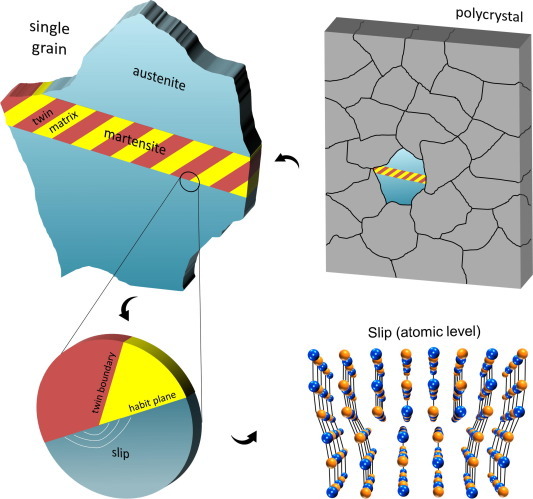 A kinetics study shows that nucleation of the crystalline phase occurs homogenously in the films. Consequently, the laser annealing process produces polycrystalline films with a random crystallographic texture. The crystallized films have a uniform microstructure across the annealed areas. The material in the crystalline regions transforms reversibly to martensite on cooling from elevated temperature and stress measurements show that a significant recovery stress is achieved in the films upon transformation. This micrograph indicates the nulceation and growth mechanism in the crystallization of amorphous near-equiatomic NiTi films. The crystal nucleates homogenously inside the bulk of the film, and quickly consume most of the film thickness, and then grows laterally in a two-dimensional growth mode. Heterogeneous nucleation at an interface was not observed due to the composition shift at those locations caused by interfacial reaction.